The history of life on Earth has been punctuated by mass extinctions. Over the past half billion years, five of these extinction events have changed the complexion of our planet’s biosphere. We are in the midst of the sixth right now, according to accomplished science writer Elizabeth Kolbert. And this time, it is not an ice age or an asteroid rocketing toward Earth that serves as the cataclysm driving countless species (some yet to be discovered by science) to their untimely ends—it is humanity. In The Sixth Extinction Kolbert trains her focus on the upheaval at hand, exploring extinctions past, present, and future through a series of portraits, some of species long since interred in the dust of biology’s past and some disappearing before our eyes. The New Yorker staff writer does her best to provide rays of hope that humans may be able to right the ship and slow a sixth great extinction event, but concedes that those rays are dimming fast. It is unfortunate that to so eloquently capture the essence of humanity’s ruinous effects on our environment and its most vulnerable species, Kolbert jetted around the world—from Australia’s Great Barrier Reef to the Amazon rainforest—burning untold tons of carbon in the process. Neuroscience is inching ever closer to explaining the cellular and molecular underpinnings of the amazingly complex human brain. 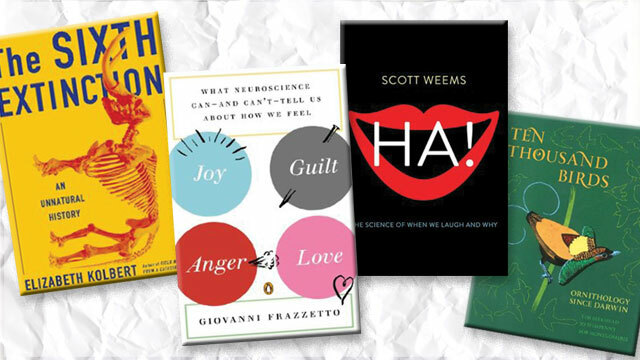 But leaving the job of understanding our most intimate emotions solely to newfangled neuroscience methods, such as the latest imaging technologies and optogenetics, is folly, explains neuroscientist Giovanni Frazzetto in his new book, Joy, Guilt, Anger, Love. Instead, he suggests, art, literature, and philosophy can help shed light on the darkest corners of the brain. Frazzetto aptly advocates for pairing advances in neuroscience with the artistic and philosophical fruits of the human mind to truly unlock the raw neuronal materials of emotion. Caravaggio and Socrates jockey for preeminence with Charles Darwin and Sigmund Freud across chapters dedicated to one emotion each—anger, empathy, anxiety, etc. Frazzetto also finds room to pepper the text with anecdotes from his own emotional and scientific life to highlight the usefulness of blending research with an appreciation of art and philosophy in the study of our own minds and feelings. Like other perceptions of the external world, humor lies in the brain of the beholder. But how exactly do our brains process jokes, one-liners, or puns and signal the universally (and uniquely) human utterance of laughter? This question is the premise of Ha!, a new book by cognitive neuroscientist Scott Weems. Weems’s central idea is that humor and laughter are by-products of the complex workings of the brain, rather than a separate function seated in some funniness control center. Drawing on both current neuroscience research and amusing anecdote, the author steers clear of reductionism and builds his case that humor is more diffuse and complex than other emotions and perceptions. Class Aves is a colorful and diverse group of organisms. But the scientists who’ve studied the winged animals for the past century are every bit as eccentric and fascinating—rare birds indeed! Ten Thousand Birds, a new book from veteran ornithologists Tim Birkhead and Bob Montgomerie, together with animal behaviorist Jo Wimpenny, delves into ornithology’s recent history. It highlights the lives and work of well-known figures, such as Konrad Lorenz and Rachel Carson, as well as lesser-known scientists, such as Baron Franz Nopsca von Felsö-Szilvás, who traipsed around Albania at the turn of the 20th century disguising his great wealth by donning shepherd’s garb and searching for fossils that linked dinosaurs to birds. Later, he served as a WWI spy and made a failed attempt to become king of Albania. And the Baron isn’t the only bizarre ornithologist of yesteryear to appear in Ten Thousand Birds. One of the strangest is Colonel Richard Meinertzhagen, a pathological liar who fabricated data, stole specimens from museums, and most likely murdered his wife to take up with a much younger woman. The book is also full of useful information. It’s chock-full of interesting facts about birds and about how their study has evolved, making it essential reading for the ornithologically minded.